no mas pantalones: SELECTOR! "SIGNATURE"
There was a time I hated logo tees, with the over abundance of Gap arched logo tees and sweatshirts so undeservingly trendy in their blandness. It's funny because now I look back at them with more of a feeling of nostalgia than disgust. In contrast, brands today have realized they need a strong logo that conveys their style instantly if they hope to stand out in the sea of competitors both big and small. One look through the brands I've featured on this site and you'll agree independent apparel companies have fully embraced this idea. 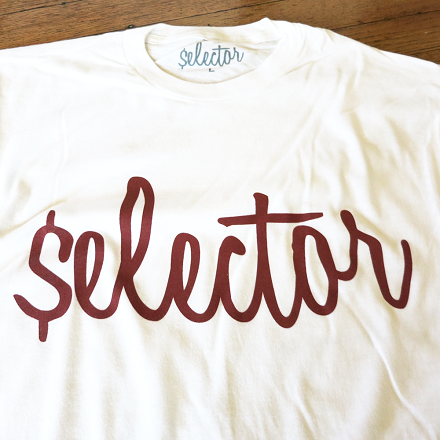 Even if you aren't familiar with Selector! 's reggae roots, you can definitely appreciate the wordmark featured on their "Signature" tee. Its casual thick to thin lines, hand drawn feel and the clever playfulness of the "S" resembling the symbol of the U.S. dollar sign may look so perfectly effortless, but make no mistake, it's far from unrefined. In doing so, it conveys the laid-back and easy-going vibes associated with this genre of music. The design's current incarnations in the Selector! shop includes white and navy tees, as well as a white women's racerback tank.